Trivia will be happening this Tuesday night, March 19th at 8:30 PM, with "March Trivia" as the Special Category. 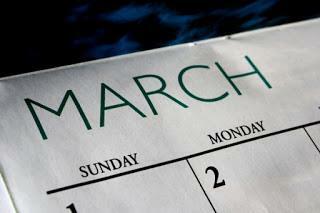 It will be seven questions connected to the month of March in history and pop culture. The Q Train lightning round will be "Country Nicknames Trivia." I will give you the nicknames of ten countries from around the world and you have to tell me the nation I'm talking about. "'The Best a Man Can Get' is what company's slogan?" We had a huge turnout last week, and hopefully that's a sign of things to come on Trivia Night. So I suggest you get in a bit early on Tuesday night so you can get a good table or seat. Hope to see many of you this Tuesday!